In a statement this evening, the company said that the two people had paid a “significant deposit” to travel beyond the moon. A Falcon 9 rocket carrying the SpaceX Dragon spacecraft sits at launch complex 40 at the Cape Canaveral Air Force Station in Cape Canaveral, Florida. SPACEX, THE PRIVATE space company owned by PayPal founder Elon Musk will fly two private citizens to space next year. “We are excited to announce that SpaceX has been approached to fly two private citizens on a trip around the moon late next year. They have already paid a significant deposit to do a moon mission. “Like the Apollo astronauts before them, these individuals will travel into space carrying the hopes and dreams of all humankind, driven by the universal human spirit of exploration. We expect to conduct health and fitness tests, as well as begin initial training later this year. Other flight teams have also expressed strong interest and we expect more to follow. Additional information will be released about the flight teams, contingent upon their approval and confirmation of the health and fitness test results. The company thanked NASA which provided most of the funding for Dragon 2 development. 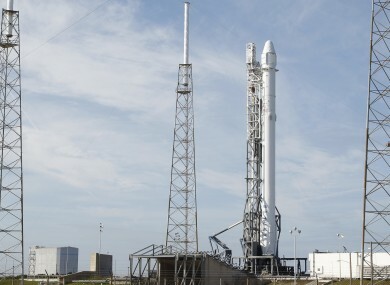 The mission will make use of the Falcon Heavy rocket, which was developed with internal SpaceX funding. Falcon Heavy is due to launch its first test flight this summer. At five million pounds of liftoff thrust, Falcon Heavy is two-thirds the thrust of Saturn V and more than double the thrust of the next largest launch vehicle currently flying. The development of the Dragon programme could signal a major step forward in space tourism. Thus far, seven civilians have travelled into space, starting with investment banked Denis Tito, who spent seven days in space in 2001. Most recently, Cirque du Soleil founder Guy Laliberté spent 11 days in space, paying $40 million for the privilege. Last week, SpaceX docked an unmanned cargo ship packed with food and supplies for astronauts at the International Space Station. Email “Two space tourists are going on a trip around the moon next year”. Feedback on “Two space tourists are going on a trip around the moon next year”.